Some persuasion over a land title in Haiti, where a US-led military intervention and long occupation allegedly restored the rule of law. I am hesitant to write to you – but don’t have many options. Subsequent to our being introduced by Richard Morse at my hotel, the Hotel Florita in Jacmel, on Saturday March 26. 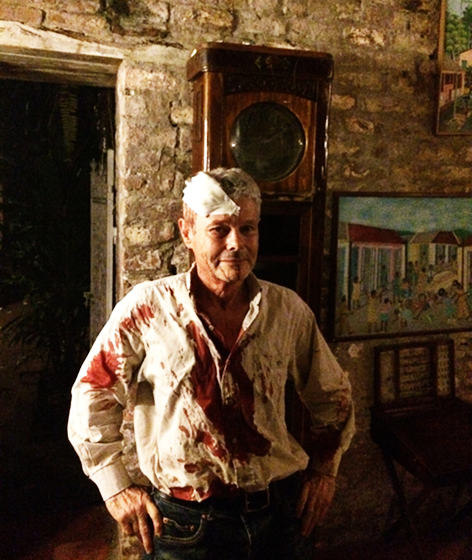 I was attacked on my beachfront property in Ti-Mouillage, Caye-Jacmel, Sud-Est. My land, 2.13 carreaux, was bought by me in 1999 – from Americans who purchased it in 1973. My ownership was never questioned until 2013 – when the land became valuable. (It’s current value is approximately $500,000). The current state of affairs is that although it has been seized it cannot be sold. But that is precisely what I am facing now and I cannot delay taking action. It is now being sold. A week ago I went with the manager of the Florita and our carpenter to the property to take down the posts put up to facilitate the sale of the land. We were attacked by four armed men. My head was split open while they decided what to do with us. I was known to them and my nationality seemed not to be a deterrent. I suffered a concussion. I have received death threats and the threatened destruction of my hotel. I am not a fearful person but these are things I cannot entirely disregard. My neighbor had his land and vacation house similarly seized and when he attempted to return to it he was chased off his property with a similar warning not to return. His house was subsequently razed – and the failure of local authorities to intervene has emboldened these people – and there hirelings – to the point that they feel they do as they like without having to concern themselves with repercussions. Although the perpetrators in the attack have been identified and the police know their whereabouts no arrests have been made. They are considered “armed and dangerous” so it has been indicated that it will be expensive to have them arrested. And even if they are arrested they are only employees of the family (formerly politically connected) that is responsible. Any assistance that you might be able to provide will be very much appreciated. My best regards to your family – and hope to see you again in Jacmel at a more tranquil time. I am not usually reduced to having to seek the help of busy people who innocently happened to have stopped in for lunch at my hotel! Please feel certain that while I will be grateful for any suggestions or assistance I have hesitated in asking you for help and only do so as I feel I have exhausted other available options. I’m very sorry to hear about your troubles and particularly concerned about the potential risk you are running of physical attack. 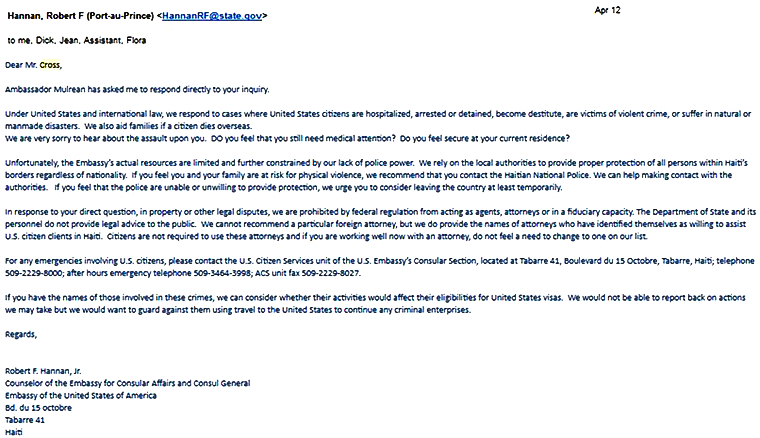 I have copied our Consul General, Bob Hannan, on this message, as he is responsible for American citizen services at our embassy and can follow up with a more detailed message. We had visitors this morning. Things are going to get quite ugly very quickly. We are being threatened and taunted as “our” lawyer, Maitre Ephesian Joissaint, has the original of the deed and we can therefore do nothing, failing to get us to pay $100,000 is getting a percentage from each sale. There can be no further delay. This is happening to many people who own beachfront property – including other Americans. Quite simply: we need help. Next articleEditorial, A jihad without Americans?